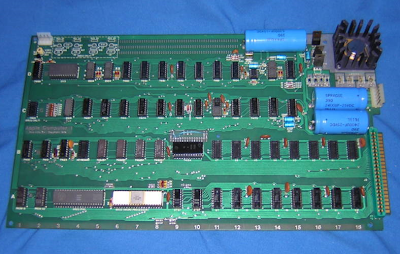 This particular auction includes the Apple 1 motherboard with 4K RAM installed, all original Apple 1 components, a keyboard with modified cable for the Apple 1, RF Modulator, the Apple 1 Cassette Interface card with all original components, six Apple 1 program tapes (Monitor/Disassembler, Integer Basic, AppleTrek, Hamurabi, Maze Creator, and Blackjack) and a rather impressive Statement of Authenticity signed by Steve Wozniak (Apple Employee #1). In case you don't want to bid on this beauty -bids do start at 30,000$ I'm afraid- you could find out more about it at Wikipedia, SB Projects and Low End Mac. 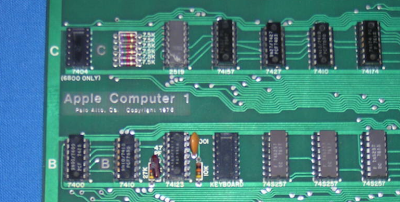 And you can of course emulate the Apple-1 via MESS. What a piece of history! Thanks for the pointer. I hope there are a few dot-com millionaires who know their roots and will bid that one up. Better yet, how about a millionaire that gifts one to retro treasures? No bids yet? What a crime! Well, it seems it might be a tad to expensive for this day and age, though I'm pretty sure it will eventually be snapped up. So do I my friend. Actually I'm entertaining the thought of visiting one of those computer history museums and expos. Well, it finished at $42,766.00...I'm trying to decide if that number (or $1 less) has some sort of computer geek significance (I should know, too!) but yeah, at least it got a few extra bucks beyond the opening bid. Now you just have to wait for it to show up on your doorstep! Also - I just noticed the $228 shipping charge....doesn't that seem a bit absurd?? I get that it's a pricey item, but one doesn't have to be quite so obvious in the overcharging of the wealthy bidder.